Crossed sabers were originally worn on the front of the 1851 cap or shako by officers of the dragoons. In 1858 the new pattern Jeff Davis Hat replaced the original 1855 cavalry hat, which lacked branch insignia. Crossed sabers were worn by both dragoons and cavalry. The original distinction was that dragoons worn crossed sabers edge up (hilts at the bottom) and cavalry worn edge down (hilts at the top). This was revised such that both branches wore them in the familiar edge up fashion, but dragoon had their regimental number at the top and cavalry at the bottom. In August 1861 the dragoon regiment were renamed and renumbered as cavalry regiments and officers all wore crossed sabers with a silver regimental number at the top as in our example. Various styles of crossed sabers exist. Most are like our example with the sabers crossed in the middle. Others are crossed closer to the hilts so that the ends of the scabbards with the drags extend laterally beyond the end of the hilt. Hilt detailing also differs. An oval border of Jaceron wire surrounded the design, particularly the larger ones intended for the hat as in our example. 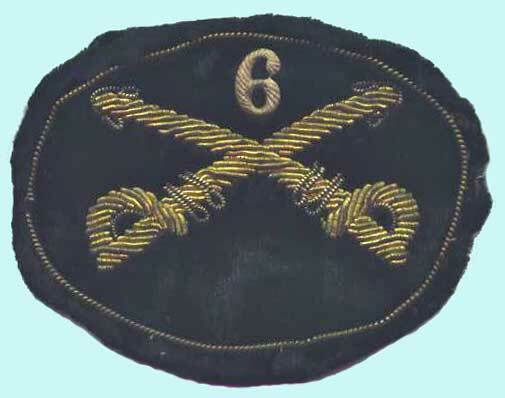 The regimental number six is silver colored, metallic false embroidery and added above the crossed sabers. In other examples it will be itself of true bullion embroidery.